Without question, the parables of Jesus are the most-loved and most-used texts in the entire New Testament--a blessing, opportunity, and challenge to preachers, study groups, and congregations alike. They are the most-loved because as word pictures, they are immediately accessible. We can imagine the situations they describe and wonder how they apply to our own lives. The parables also bring us as near to Jesus as we can get. Biblical scholars agree that the parables are the most authentic words of Jesus available to us, and we value them for that reason. At the same time, the parables present many challenges. The parables appear more than thirty times in the Revised Common Lectionary. Ministers are called to preach the parables over and over again. It's not easy to approach the parables in a fresh way, or to gain new insights from them when we hear or preach them so often. 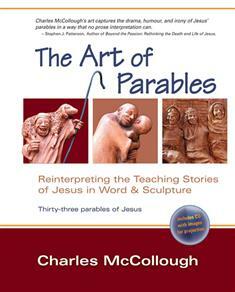 Which is why The Art of Parables by Charles McCollough is such an indispensable resource. A theologian and artist, McCollough knows the parables intimately and offers a unique, two-pronged approach to each of the thirty-one parables contained in the New Testament: First, McCollough interprets each of the parables through sculpture. Seeing and approaching the parables visually, through art/sculpture, opens up new levels of understanding. Second, McCollough takes full account of the social, economic, and political context in which the parables were told, with often surprising and challenging results. For example, the Good Samaritan and the Prodigal Son parables have been used in endless ways to refer to compassionate care of the stranger and to forgiveness of wayward children. But are these the meanings Jesus intended? Not necessarily, says McCollough. This illustrated book (and the accompanying CD of images for projection) will be an invaluable resource to anyone who wants to explore the ethical and social justice issues contained in the parables of Jesus in a unique way that honours the contribution of the arts.